Enhances mental function improving concentration, analytical ability and perception. Overcomes negativity and bitterness, healing inner anger and gives one courage to start again. Dissolves inner tension, builds self-confidence and acceptance. Awakens ones inner talents. Strengthens the eye sight. This mineral is actually fossilized tree sap. It strongly stimulates the body to heal itself by absorbing negative energies and transmuting them into a positive force. It will cleanse and bring positivity into any environment where it rests. It helps bring stability to ones life, inspires us to be motivated and driven towards our dreams and goals and promotes creative self-expression. It can be used to clear depression and promote a positive mental state. A stone of spirituality and contentment. It bestows stability, strength, invigoration and brings a sense of deep peace. It can help one maintain a calm temperament by clearing away any unkind or unproductive vibrations. It protects against psychic attack, helps overcome an addictive personality and dispels fear and anxiety. It can be used to open ones intuition and psychic ability. It can ease headaches and help one to get to sleep at night. A fossilized sea snail dating back about 250 million years. Good for anyone who works in construction or architecture. Provides strong protection and stability. Helps alleviate depression. A stone that enhances humanitarian pursuits and teaching. It enhances communication abilities, storing information and creativity. Removes blockages and congestion from the chakras. Brings knowledge by clearing away confusion. It truly awakens the finer inner self. This beautiful mineral contains two stones. The green colour is serpentine, the pink is stichtite. Promotes thinking with love prior to speaking with intellect. It assists one in being gentle with oneself and others. It helps to provide one with openness in opinions and faithfulness in promises. It gives one a sense of calm and peace. It is said to help the skin spring back after pregnancy. Protects against all forms of electromagnetic smog and radiation. Protects from all kinds of negative energy. Increases physical vitality. Clears tension and stress. Promotes a laid back and positive attitude. Strengthens the immune system. Helps keep one grounded, promotes emotional stability and practical creativity. Enhances ones well being. Assists one in communicating their thoughts and feelings. It cleanses the throat chakra and releases neck and shoulder tension. Counteracts suppression of feelings unreleased due to fear, allowing you to speak and live your own truth. It releases mental stress. A nurturing and supportive stone. This stone works well to stimulate the throat chakra, allowing one to become conscious of and then to verbalize exactly what it is you wish to manifest or communicate. It allows one to see all things as equally important in life and to be unburdened by arrogance. It promotes individuality and creativity and replaces negativity with a love and joyfulness for life. It is a potent crystal to use for manifestation work, helping one to absorb from the universe what is needed. It promotes receptivity, awareness and expansiveness. Brings freshness and newness to ones life. Helps one to enjoy happiness in the moment and stimulates the inner spirit to reach new heights. Helps protect one from negativity and to see where it's coming from. An excellent healing stone which promotes harmony and perfection within the body. Banishes feelings of sorrow, fear, envy and rage. It banishes all forms of emotional negativity replacing them with a love for life. Brings out ones inner talents, gives courage and promotes positive life choices. Helps sharpen concentration, improves motivation and dispels mental lethargy. Helps you to trust yourself and your perceptions. This stone helps you to accept the present moment as being perfect. It will aid you in coping when changes are occurring in your life whilst stimulating the very best possible outcome for you. It helps stimulate your inner vision, it releases deep seated fears and will help you to overcome resistance and put things into perspective. It can help reduce stress and worry and is a great stone to work with when you are exhausted. Used from ancient times to ward off the evil eye and curses. It can help one to face reality, dispelling illusions and calming fears. Helps clear feelings of guilt and stabilizes the emotions. It assists in attuning to the soul's purpose. This beautiful stone is said to promote the love of truth. It enhances compassion, a non-judgemental attitude, acceptance for yourself and others and fidelity. It can help to reduce superiority or inferiority complexes and will help bring a sense of security and trust. It stops you speaking out in anger, prevents nightmares ( especially in children ) and helps draw out the best of your talents and creativity. Aids relaxation and a good sleep. A warming, creative and highly energizing stone, it is one of the few stones which never needs cleansing. It is known as the stone of abundance attracting wealth, success, prosperity and all good things. A truly joyful stone it has the power to impart this joy to all who behold it. It helps raise self-esteem, self-confidence and removes destructive tendencies. It enhances individuality, self-expression, motivation and can help you be less sensitive, especially to criticism. "Faden" is derived from German meaning "thread". This quartz has the inclusion of thread like fibrous formations. It is a stone of connection, stimulating and furthering connective forces between self and chosen recipient. Promotes physical, mental and emotional stability. Cleanses the aura and may open the chakras if desired. Helps "mending" on all levels, molecular, cellular or to trace the root of any disorder to be restored to balance and health. A highly protective stone, especially against psychic attack. It helps cleanse and stabilize the aura and is very good at clearing the electromagnetic smog caused by computers, mobile phones etc. It cleanses, purifies and brings everything into perfect alignment within the body. It increases concentration, promotes quick thinking and can ground nervous or excess energy. It helps you to understand the effect the mind had upon the emotions and the body. Known as the stone of health this is a highly regenerative and energizing mineral. It can help you to alleviate emotional disharmony. It bestows confidence and shows you how to open your heart. It is a stone of commitment, instilling love and devotion. It is good to turn to in times of crisis as it activates and strengthens ones survival instincts. It can help you let go of old ideas or behavioural patterns that no longer serve you. This is a great stone to ground you if your head is constantly in the clouds and to offer you protection. It dissolves negativity and prevents negative energies from entering your aura. A strong stone, it supports people of a timid nature, boosting self-esteem and imparting confidence. It removes self-limitations and aids expansion. It is a stone which can help you overcome mistakes and accept them as learning tools in your life. It is an iron based mineral and is good for strengthening and regulating the blood supply and can aid circulatory disorders. Originating from the Herkimer area of New York State in the US. They are a pseudo Diamond in the way that they have a much higher carbon content than ordinary Quartz which is a Silica mineral. They will clear the chakras and stimulate release and transformation so you may grow spirituality and move towards your soul's purpose. They are one of the strongest crystals to clear electromagnetic smog and radiation. They clear the body-mind system of unconscious fears and repressions, allowing for total relaxation and expansion of life energy. This stone has a gentle, grounding, protecting and strengthening energy. It draws in spiritual power to surround you with light. It can be powerfully detoxifying, clearing us of any held negative energy whilst showing us what has been stored. It can also be known as "velvet labradorite". Actually formed by fossilized wood. It has been used as a talisman since ancient times. It protects against negativity and fear. It promotes taking control of ones life. Balances mood swings, eases depression and brings stability. It helps one to stabilize their finances and is said to protect ones business. Good for migraines. This is another of the few stones that never needs cleansing as it doesn't absorb any negative vibrations. It is a stone that encourages one to speak and live their own truth without fear. It helps bring clarity and strength and will give one extra energy to those tasks which normally drain us. It instantly aligns the chakras and with conscious direction can open them. It can stimulate psychic abilities and intuition and stimulates the higher mind. It is a tranquilizing stone and can lower the blood pressure. This stone helps banish fears and insecurities and removes the " psychic debris " left behind from previous disappointments. It strengthens faith in self and trust in the universe. It deflects unwanted energy from the aura making it highly protective and will prevent energy leakages from the aura. It helps calm an overactive mind whilst at the same time stimulating the imagination. Labradorite allows you to be the person you want to be without being swayed by other people's opinions. Can stimulate enlightenment, psychic abilities and spiritual power. It quickly releases stress bringing a sense of peace. It possesses enormous serenity which is the key to spiritual attainment. It protects against psychic attack, returning the unkind thoughts to the sender. It teaches one the power of the spoken word and can help reverse curses. It encourages taking charge of your life, revealing inner truth, self-awareness and encouraging self-expression without holding back or compromising. It brings honesty, uprightness and compassion. It is a good stone to use against migraines and depression. This beautiful mineral, also known as pectolite , will naturally raise consciousness and harmonize your body and soul to higher vibrations. It helps to clear guilt and remove fear. It encourages going with the flow in life, serenity and clarity. It re-connects us to our inner joyful child-like state. It connects to the Earth Goddess, helping women attune to their femininity and to nature. It is an antidote to emotional extremes and is good to ameliorate bipolar disorders. It radiates complete love and peace. Clears electromagnetic pollution and radiation. Clears blockages and dissipates negativity. Extremely good for stress reduction. Helps with depression, relieves despondency and halts obsessive thoughts. Stabilizes mood swings and bipolar disorder. Overcomes dependency and addiction in all forms. Releases and reorganizes old psychological/behavioural patterns and stimulates being happy in yourself. A highly protective stone that shields you from all kinds of negative energies, pollutants, radiation. Helps you to see the root cause of disease and clears and activates the chakras. Facilitates deep emotional healing and transformation. Encourages self-expression. A stone which has malachite and chrysocolla together. It brings in joy, wholeness and peace. Releases introversion, enhances ones adventurous side and supports friendships. Helps you release negative experiences and old traumas. Excellent for lung and breathing disorders. A magical stone that contains the wisdom and knowledge of shamans, alchemists and other workers of magic. It combines earthly and spiritual vibrations, giving you access to both realms. It balances yin - yang vibrations, helping the masculine and feminine sides in us be in complete balance. Moonstone is a great stone to soothe emotional instability and stress. It helps stabilize the emotions and can improve ones emotional intelligence. It can draw out emotional patterning which has not served you so that you may understand it and then dissolve it. It provides for deep emotional healing and heals disorders of the upper digestive tract that are related to emotional stress. It helps alleviate all forms of menstrual dis-orders as it works strongly upon the female reproductive system. It is a stone influenced by the moon, making it soft, passive and feminine. It will always like to be placed outside in the light of a full moon. Believed to have the highest vibration of all stones, and used with other stones it will take them to their highest vibrations. Moldavite is the fusion of extra-terrestrial meteorite with the rocks from Earth. It was formed by a meteor shower in Czechoslovakia and these crystals will become extinct. This stone takes you to your highest spiritual dimensions and facilitates growth. It opens and clears blockages from the chakras. It assists in detaching you from earthbound security worries and issues such as money and the future. It is best used with grounding stones due to its' spacey qualities. Do not cleanse with salt water. A strength giving stone offering support during difficult times, times of great mental confusion and times of stress. It promotes stamina, centres your energy and helps you access higher guidance. Onyx can be used to heal old griefs and sorrows. It helps us to have more stability in our life and imparts self-control. It gives us the gift of making wise decisions. It is a good stone to help us overcome overwhelming fears and anxieties. This stone is a powerful cleanser. It helps remove and neutralize toxins, purifies the subtle and physical bodies and helps one release old vibrations and negative patterns. It enhances confidence and helps you to find the gift in your experiences and will motivate you to grow. It helps you take responsibility for your own life, and helps you to see mistakes you have made and to move on from them. It sharpens the mind and brings us to new levels of awareness. It shows us how we can detach from outside influences and look to your own self for higher guidance. Known as the stone of angels, furthers ones connection to angelic and ancient realms. It has a high, pure vibration. Releases negative karma and also clears entities from the aura and mental body. It enhances and energizes anyplace it is kept. Excellent to use with meditation as it helps you to easily reach the "no mind" state with total peace and relaxation. An excellent preventative which shields one from many forms of negativity. Just having a piece on ones person provides a protective shield from all forms of negativity as well as keeping out various environmental pollutants. A unique protector, excellent to keep with you when attempting any dangerous work/projects. Pyrites energy inspires the universal energies to activate the nourishing energies of the body, allowing the attainment of physical perfection and encouraging the flawless ideal of health, intellect and emotional well being. It's warmth promotes memories of love and friendship. Quartz will raise your energies to the highest level possible. It cleanses and enhances our whole body and deeply cleanses the soul. It absorbs, releases, stores and regulates energy and is great to unblock stagnant energy. It can be programmed to work on any ailment or issue. It clears and activates all the chakras and strongly energizes them. It can help you clear inner negativity and stimulate positive thoughts and feelings. It works well to protect one against harmful radiation. A strongly protective stone. It teaches you about your spiritual nature. Helps release old debris stuck in the heart chakra and replenishes energy there too when worn or carried. It draws of stress and negativity from the body and aura. Brings light and love to ones life. This stone is calming, reassuring and brings deep inner healing. It will aid you in times of heartache or crisis. It brings you confidence, self-esteem, self-worth and self-love. It purifies and opens the heart chakra on many levels. It gently removes negative energy away from you replacing it with love. It helps balance the emotions and makes you receptive to love, as well as attracting love into your life. It encourages you to be forgiving and accepting. It is said to increase fertility and to strengthen the physical heart. Encourages passion for life, courage and selflessness. It increases physical vitality and self-worth. It shields us against psychic attack and emotional vampires. It can amplify the energies of other crystals making them more potent which can then increase and bring speed to the healing process. It helps one overcome co-dependency and the tendency towards martyrdom. It encourages one to follow their bliss. It is a stone that keeps the mind sharp with heightened awareness. This stone helps us let go of the past and breaks down any barriers there may be that are blocking us towards spiritual progress. It will filter negative energy from you whilst at the same time supporting your energy field. It helps soothe dark moods, helps one to get to the root of any problem and relieves fears, phobias and anxiety. It is a stone that counteracts self-hatred and promotes forgiveness in all forms. 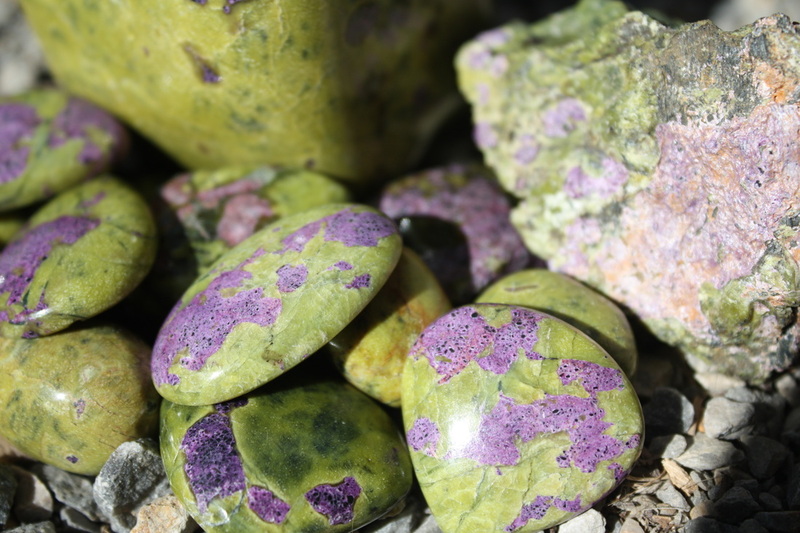 This stone also helps aid fertility, draws mercury poison out of the body and is an excellent stone to use for chronic exhaustion and general depletion. Provides for clarity of the mind, expanding awareness of the self and the environment. It clears confusion and aids in seeing the bigger picture. Helps remove toxic heavy metals from the body(especially from amalgam tooth fillings). Helps to overcome free radicals(which can cause wrinkles, tumours etc ) and is said to extend the life span. Purifies and cleanses the body. Stimulates ones affinity with "all"-helping you feel connected and calm. It dissipates feelings of anger and exasperation. Enhances circulation, helping to relieve "chills". It aids a high vibration and spiritual attunement. Helps one in seeing and understanding the stages in ones life and provides insight to any changes needed to promote peace and happiness. Removes negative vibrations and is strongly protective. Relieves fear, brings emotional calmness and helps lift depression. Helps you to accept yourself and stay positive. A good stone to use for grounding you when your head is in the clouds. A superb antidote to stress. A stone of purity that helps bring balance to the body, mind and spirit. It helps you to recognize and release mental patterns that bring you stress and harm. It promotes being centred in yourself and helps you to feel empowered. It is calming and soothing and teaches you how to find the value in your mistakes as well as your successes. A stone that helps you stay true to yourself. It helps eliminate mental confusion. It encourages rational thought, truth and intuition. It calms the mind allowing new information to be received. Enhances self esteem, self acceptance and self trust. Boosts the immune system. Teaches you how to live form your own truth and reminds the soul for its reasons for incarnating. Helps find answers to spiritual quests. Protects the soul from shocks, trauma and disappointments. Can bring light and love to the darkest of situations. Alleviates sorrow, grief, fear and despair. Drains off negative energy and channels healing energy into the body. Natural iron stained quartz. Excellent to use after shock and trauma, especially at the soul level. Used to protect against psychic attack. Can be used in past life healing and is beneficial where the soul feels it has to pay for previous mistakes. Stimulates creative energy. This stone brings out integrity and shows you the correct use of power. It helps you recognize your own needs as well as the needs of others. It is a good stone to banish the blues, bringing brightness and optimism to the wearer. It is a good grounding stone, for those of you who are feeling spaced out. It helps one to be practically minded and to have clarity. It is a peaceful stone with soothing vibrations. It can be used to stimulate intuition and psychic ability to those who are grounded and earthy in nature. Recognized by the sea creature and fossil snail inclusions. This is a protective stone. It helps you to project more positive thoughts into your life-and all its trials and tribulations. It increases ones survival instincts. Helps to combat fatigue. Used since ancient times as a stone of protection. Turquoise is a very good healer and will bring you a sense of well-being. It enhances your communication abilities and helps you in living and speaking your own truth. It dispels negative energy, stabilizes ones moods and instills inner calm. It is an excellent stone to use when you are exhausted or depressed. It strengthens the body, mind and spirit. It shows us how the creation of our very own fate is actually ongoing and depends upon your actions at each moment. SIGNS : Sagittarius, Pisces & Scorpio. The stones we choose for our zodiac sign will compliment and balance the traits and characteristics of our sign. They will work more directly on the ailments that your sign is prone to. The stones we are automatically drawn to just when we look at them have been chosen by our intuition to work on us now, for whatever issues or ailments we are currently dealing with.